Listed below are the Glass Shows I plan on attending in 2012. The shows are a great way to see a fantastic variety of items all in one place not to mention all the great people to meet and talk to about glass. I hope to see you at a show in your area! Age 30 and Under FREE with Valid I.D. 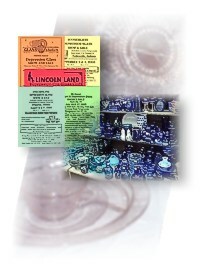 Special Exhibit: National Depression Glass Assoc. Union Food & Commercials Workers Union Bldg. South of 13 Mile Rd. West of John R Rd. Civic Center 2 miles on left.